All songs published by Count Music, BMI, © 2000 All rights reserved. All song lyrics are available by clicking the "Lyric" link below the song. 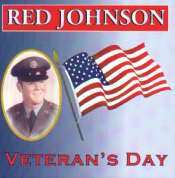 Click here to purchase "Veteran's Day" at CD Baby! !23 Greeting Cards for Veterans - Send Free Online Greeting Cards to your friends & loved ones. ALL cards are absolutely FREE! Veterans Day is a day, when we give thanks to our brave veterans and heroes for the freedom and peace we cherish ! We honor and remember the gallant soldiers who served our country. Reach out to wish all your friends and family and pay tribute to those brave heroes on Veterans Day !